All right, your new house has Corian counter tops in the kitchen. Or Avonite solid surface, Meganite, or another brand. And the cabinet doors have old plastic or pitted chrome knobs from 1957. 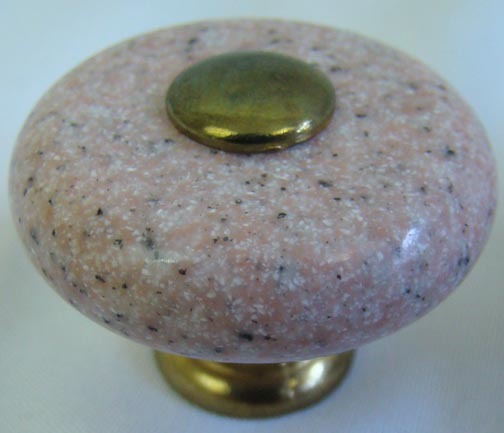 If you would like a change, and something that will match or potentially matches, check out the solid surface knobs from Rock Solid. In older kitchens or bathrooms, you may have an old discontinued color, but there might still be a match available. Since there are many similar color groupings, you can find a close enough match. Now of course if you have a more modern home and a current color, you are in better luck. If you know your color name, the odds of exact matching are much better. If you are building a house, take note of your solid surface color names. All knobs have complimentary metallic accent pieces. You have a choice of polished brass or polished chrome, then brushed chrome. On the 123 knob, it also comes in brushed brass. Then the 136, 137, and 139 knobs have a burnished antique brass choice. If you are building a new home or remodeling a kitchen or bathroom, and if you have left over scraps of your solid surface color, and Rock Solid by chance does not have any of that color available, we can have you send your sizable scraps to them so you can have drawer pulls and knobs made to match. Solid surface knobs have a nice feel to them. They are smooth and dense feeling, they seem to maintain room temperature so they do not feel cold when you grasp them. Product specs, part numbers, a price grid, and how to order info will follow below. 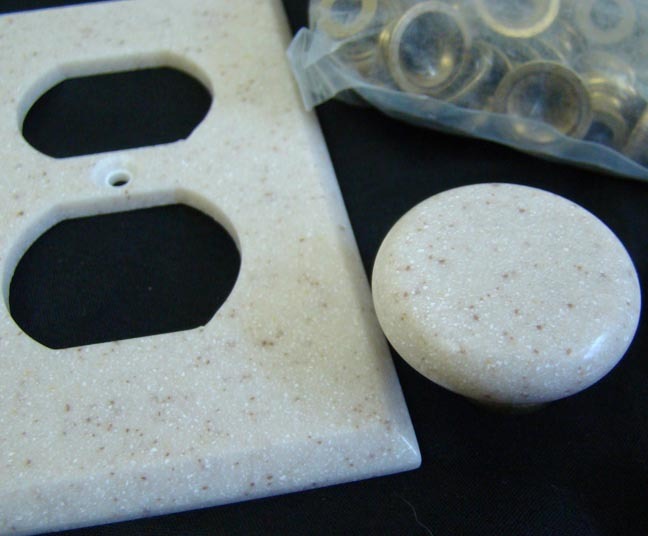 Your cabinet knobs and pulls can match your solid surface switchplates. 26 polished chrome; 26D brushed chrome; 3 polished brass; 3D brushed brass. 26 polished chrome; 26D brushed chrome; 3 polished brass; BB burnished brass. In the black and white specification diagrams above, product code numbers are noted. Please enter the prefix: ROC-, followed by the code number, and then end the part number with the color BRAND and NAME, and metallic base color. For example: ROC-136-Corian bone, polished brass. 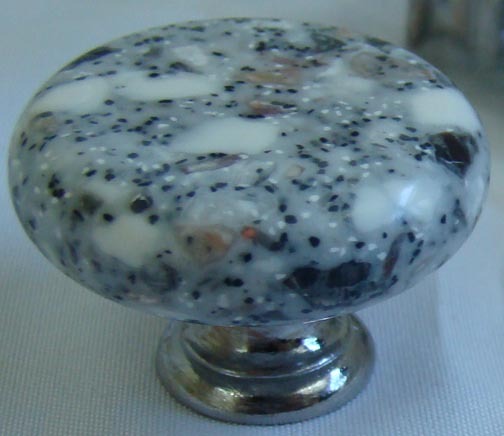 On all cabinet knobs, you will also need to note a metallic finish color for the bases. and 3D brushed brass (option on ROC-123 knob only). For Canada, Australia, or anywhere else outside the US, orders will ship to us first, and then we will add the proper International postage charge to ship it to you. We can quote shipping amounts prior to you placing an order.